At our location on Gladys Avenue in Abbotsford, British Columbia, we are hard at work endeavouring to help the poor, the homeless, the addicted, the hungry, the lonely, and the forgotten – people who are experiencing challenges with the basic necessities of daily living in our city. We make it our concern to feed them, care for them, and help them find the path to wholeness. As you explore our various ministries through these pages, you will discover what we do and why we are so passionate about our work. You may even find ways you want to get involved and make a difference in our community. Now at work in 128 countries, The Salvation Army’s operations in Canada began in 1882 and have grown to become one of the largest direct providers of social services in the country. In Bermuda, the Army has been at work since 1896. In the Abbotsford-Mission area of British Columbia, the Cascade corps was established in 1984. The ministry has two locations – the Cascade Community Church on Delair Road and the Centre of Hope on Gladys Avenue. The Centre of Hope includes Redemption Café, Meal Centre, Pet friendly shelter, emergency shelter and extreme weather shelter, Supportive Independent Living – SIL, Family services, daily produce and bread, Medical clinic, Outreach teams, housing support, case workers for advocacies and referrals and Super Sunday services. The Emergency Disaster Services has a community response unit based at The Centre of Hope. They respond to requests from fire, police, search and rescue and other agencies during local or provincial emergencies. 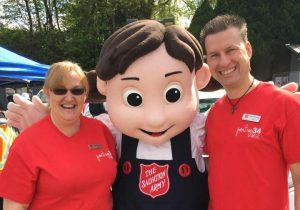 In 2008 The Salvation Army won the Abbotsford Business Excellence Award in the category of Social Responsibility. We reach out to others and care for them. We promote the dignity of all persons. We strive to be the best at what we do and a model for others to emulate. We are honest, trustworthy and accountable. We are committed to the pursuit of innovation and effectiveness. We encourage and foster teamwork and partnerships. We give thanks by marketing milestones and successes. Click to download the latest Newsletter from the Salvation Army’s Centre of Hope and stay up to date. It is a PDF document for easy printing. Volunteers are the lifeblood of the Salvation Army Ministry. Find out how you participate in a wide variety of volunteer positions with our team. In addition to monetary donations, you can support the Salvation Army and the Centre of Hope by shopping in our Family Thrift Store. The Salvation Army’s SIL program, at the Centre of Hope in Abbotsford, has been designed to provide safe, affordable, secure housing for men. The Shelter, within The Centre of Hope, has rooms for both men and women with up to twenty six beds are available each night.